Photography is all about perspective. Change it up just slightly - or not so slightly - and you can end up with an entirely different view of essentially the same ‎scene. Looking through my recent camera roll reveals a distinct vertical trend: I've been shooting down from relatively great heights. Whether it's a balcony, the roof or an upper-floor hotel room, my lenses have been pointing down for reasons I can't even begin to explain. 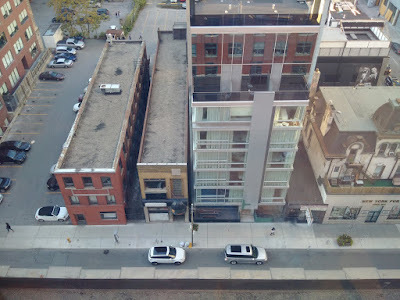 Your turn: If you've taken a photo from a height - any height - post it to your blog or website, then leave a comment here letting folks know where to find it. Visit other participants to share in the photographic experience, and feel free to share additional photos through the week as the spirit moves you. New to Thematic? Hit up this link for more info on how it all works. Enjoy, and thanks! I'm away until the weekend but will post then and comment on other contributions. I have an older pic, I think it's from before I started posting here. Better late than never. Here's mine Looking down.